This book delivers a fresh and fascinating perspective on the issue of the minimum wage. 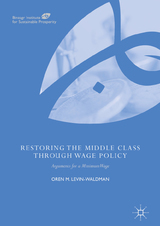 While most discussions of the minimum wage place it at the center of a debate between those who oppose such a policy and argue it leads to greater unemployment, and those who favor it and argue it improves the economic well-being of low-income workers, Levin-Waldman makes the case for the minimum wage as a way to improve the well-being of middle-income workers, strengthen the US economy, reduce income inequality, and enhance democracy. Making a timely and original contribution to the defining issues of our time—the state of the middle class, the problem of inequality, and the crisis of democratic governance—Restoring the Middle Class through Wage Policy will be of interest to students and researchers considering the impact of such approaches across the fields of public policy, economics, and political science.